I found out that each year there is a fun fly on New Year's day in Salt Lake city regardless of the weather conditions. I'll be there for sure with camera in hand. I'll be sure to post photos on here for all of you to see. I have decided to make my edited aircraft and aircraft repaints available again for the RealFlight G3 simulator. 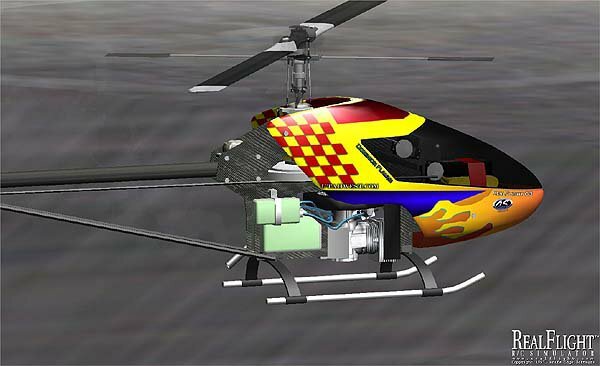 There are 4 edited helicopters, 3 edited electric airplanes and 21 edited gas airplanes for a total of 28 edited aircraft. These aircraft fly much better than the stock planes and helicopters included with G3. There are 20 paint schemes for helicopters and 10 paint schemes for aircraft. Some of these repaints and edited aircraft will require that you have the add-on disks for G3. All paint schemes will work for RealFlight G3 and G2. The edited aircraft will only work with G3. While flying my new Utter Chaos today, I was once again hit by something that interfered with my radio. The plane went down and exploded into tons of pieces. I think it is time to call the FCC to have them check it out to see what is interfering with our radios at our modelport. We have lost too many planes lately due to radio interference. 1. I clipped one wing rib off of each side of the wing. My Killer Chaos' wing was just too long and this is basically the same wing. With the wing clipped, it is almost exactly the same as the Super Kaos. I had hoped for better roll rates and I was not disappointed! 2.The horizontal tail and elevator are a built up framework that should be covered with an iron on covering. Since I was going to fiberglasss the fuselage, I sheeted the horizontal tail with 1/16" balsa and used 3/8" balsa for the elevator halves. 3. I made the plane a tail dragger instead of using the tricycle gear arrangement. 4. The plans call for a fuel tank hatch on the top of the fuselage. I put the hatch on the bottom and put the canopy a little more to the front of the airplane. 5. I made the rudder about twice as big as the original and I made the leading edge of the rudder at a 90 degree angle to the plane where the original Utter Chaos' rudder slopes aft. 6. I used a single dowel to hold the front of the wings to the fuselage instead of two. I hope I don't live to regret this change! I used Rustoleum paint over the fiberglass and used a DuPont clear coat but I found out that the clear coat is not fuel proof! The funny thing is though, I'm running FAI fuel with absolutely no nitro and it is still eating up the finish! I used Rustoleum Gold on my Super Kaos and the FAI fuel at it completely off. Another problem I have had with the Rustoleum is that it will not stick to the fiberglass or the primer. I actually used a different Rustoleum primer on this plane. On the Killer Chaos, I used a gray, sandable primer. On this modifed Utter Chaos, I used Rustoleum Auto Primer. It is black and quick drying. I am hoping the paint will stick better to it. On my Great Planes Super Skybolt, I tried using a Rustoleum latex primer so I could brush the first coat on to fill the low spots. The problem I found with this is that I can't wet sand the fuselage. The latex primer starts to ball up and come off. The plane's paint job looks really good. One of my fellow pilots saw the plane today and thought it was an ARF and he thought the fuselage was covered with Monokote until he got closer and saw that it was painted. I hope the paint will stay put so I don't have to refinish it. I can build a Chaos in one day but it takes me several days to finish one. Have any of you developed any good painting tips for fiberglassed airplanes? If you have, let's talk about it! I used a Fox Eagle 4 .60 in the plane. I bought it used and it doesn't have the compression I would like to see. I may need to replace the piston and cylinder sleeve. In the meantime, I have replaced the .60 with my Fox Eagle .74. It is exactly the same engine except for a larger bore. The performance specs of the .60 and .74 are almost identical though! I was going to go back out to the modelport to try the .74 but we had a heck of a rainstorm move through the Salt Lake Valley this afternoon. I'll go back out in the morning and see how much more performance I get with the .74. I've run the engine on the test stand and it runs great. The Bisson muffler for my Great Planes Super Skybolt came in Wednesday. I have to install the aileron servos and the throttle servo and she’ll be ready to fly! The aileron servos mount to small hatches that screw onto the bottom wing. My Skybolt has been sitting in the garage for about eight years and I have no idea where the old hatches went so I made some new ones today. I got one of them together and ran out of gas. I’ll try to get the other one together tonight or in the morning and get the servos mounted. After work, the other morning, I framed up one side of the wing on my Bridi Utter Chaos. It took me about 15 minutes! Isn’t CA glue just the greatest! For those of you that don’t remember, we used to have to pin our parts down over the plans, glue them and then wait overnight for the glue to dry. The older type glues also added extra weight! When I was younger and the CA glue had just come out, I would sit down and build until I had an airplane built. Sometimes I’d go without sleep for 48 to 72 hours. I still prefer to build airplanes from kits. I think it makes you appreciate your plane more and you know EXACTLY how that plane is built! If you’ve never flown any of Bridi’s airplanes you really should try one. The first one I built was a Bridi Super Kaos, probably around 1978. I built my second Super Kaos about three years ago and still have it although engine problems and stalling caused some damage the other day. A little epoxy and fiberglass clothe and she’ll be good as new. I just need to get an engine that will run right. 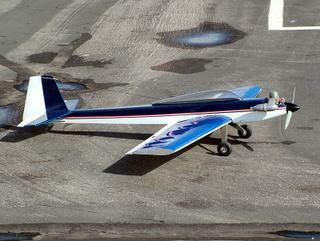 I’f I feel a little more inspired tomorrow, I’ll have my Super Skybolt ready to test fly the next day. We’ll see what happens! 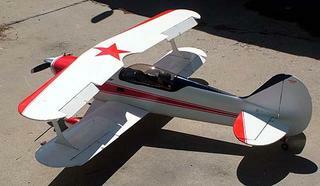 Want to Learn to Fly Your Very Own RC Airplane? 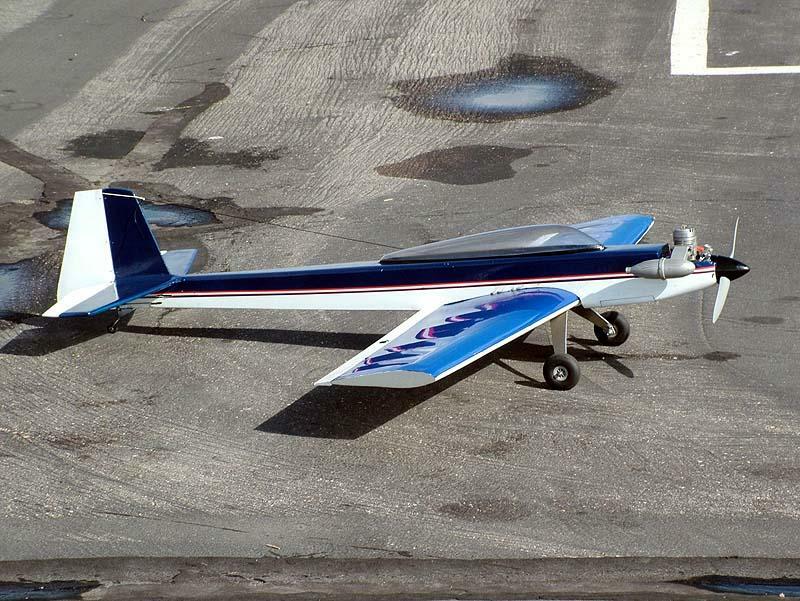 Have you ever wanted to build and fly your very own radio controlled model airplane? I have an incredible opportunity for you! I meet people all the time that want to learn to fly but don't know where or how to get started. I will build your plane for you and teach you how to successfully fly your plane. I will have details on my website soon. For details go to JayMc.com. Today, I helped John Byrne fly his Hobbico Arrow. 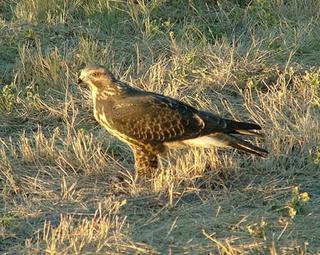 As I started home, there was a Peregrine Falcon right beside the road to the modelport. As I photographed this beautiful bird, it's mate swooped at me a couple times and made the loud shreaking noises they make. I love things like this! 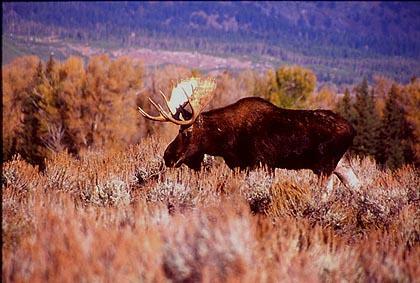 I once got very close to a moose in Grand Teton National Park. I would have been toast if the moose would have decided to take me out. Luckily, he was more interested in eating than charging me! 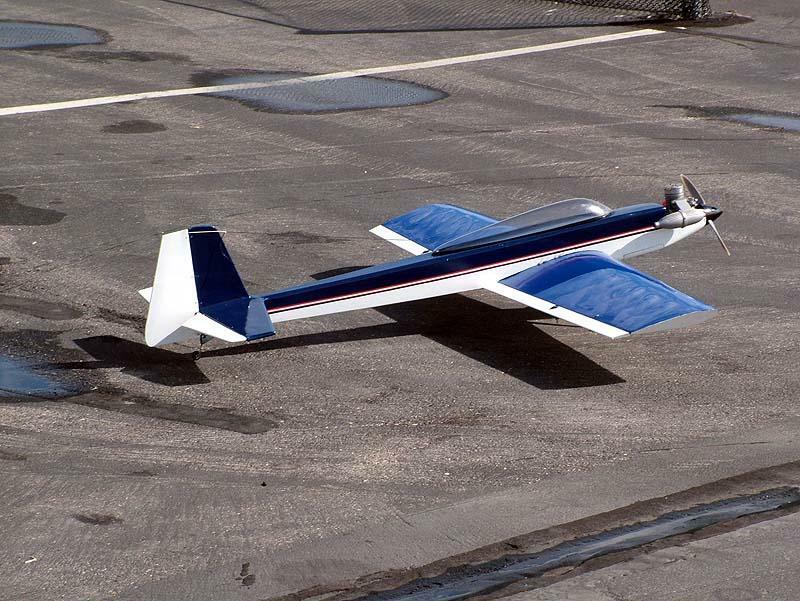 Wow, check this out, my own RC Aircraft Web Log, or BLOG as they are commonly referred to. It's hard to update my website everyday, so this new BLOG will keep you informed of what is going on with me and RC flying in Salt Lake City! On my website, you can find all sorts of information about flying in Salt Lake City. We have a GREAT field, the Jordon River Modelport. It is actually a Utah State Park. The runway is paved and there is a large pit area for the pilots. It is quite literally, one of the best model airports I have ever flown from. 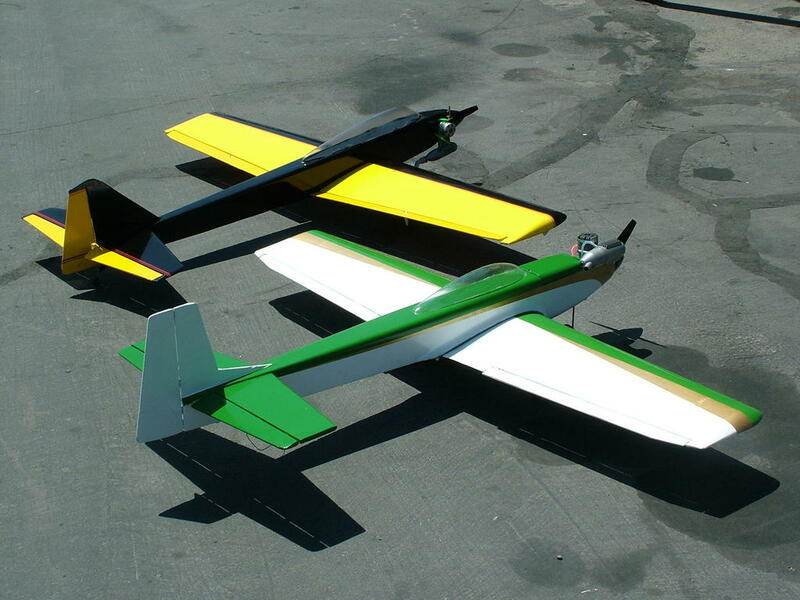 Last week, I crashed my Bridi Killer Chaos (that's the yellow and black airplane in the photo,,,the green one is my Bridi Super Kaos). I know that all of you newcomers to the RC aircraft hobby are probably not aware of any of Joe Bridi's airplane kits. In my opinion, they were some of the best building and flying kits ever developed. Just a few of his designs are still available through BlueJay Aircraft in Stratten, Nebraska. You can see the airplanes online at BridiAirplanes.com. I have built two Super Kaos kits (no longer available) and one Killer Chaos. Unfortunately, my Killer Chaos had an abrupt meeting with the earth last week after the radio failed. The plane was fast and seemed about twice as fast when it decided to put a crater in the ground. I'm really going to miss that airplane. It performed aerobatics with grace and style and landed like a trainer! I have a new Utter Chaos ordered and it should be here sometime this week. The only problem is that winter is approaching quickly and I don't know if I'll be able to build the kit in time to do much flying before cold weather and short days set in. My ten year old Great Planes Super Skybolt biplane is almost ready for her new, maiden voyage. I flew the plane about six times and it has been sitting in my garage for about eight years. I sold the engine, which was a Saito 1.50. I finally decided to strip the Monokote off of the fuselage and replace it with fiberglass clothe and epoxy resin with finish coats of Rustoleum paint. The plane looks great and I'll get her in the air as soon as I get the muffler for the ASP 1.08. Any word from any of you on the redhead ASP 1.08? I'm hoping it will be enough power to fly this beautiful plane like she deserves. I'll be posting more as days go by. I'd love to hear your comments.